Swimming requires your arms and legs to remain in motion in order to stay afloat and propel yourself backward or forward. There are four fundamental strokes in swimming, all of which use the arms in a different manner. The legs, for the most part, perform the same action when swimming. Regardless of the type of stroke you're swimming, the key is to make fluid and elongated strokes, which optimizes your maneuvers through the water. The breaststroke requires your arms and legs to remain underwater at all times. Your arms must be brought together in front of your face with palms facing out. The arms then are extended forward and spread out to your sides, pushing water backward with your palms. Once the arms are slightly below your shoulders, pull them back in and bring your hands together again in front of your face. The legs are bent at the knees and the feet are pulled in toward your buttocks as your hands come together. Extend the legs at the same time as your arms and push water backward with your feet. Repeat these movements rhythmically and breath in synchronization with the movements. During the freestyle stroke, the arms mimic a windmill. Bring your right arm out of the water by your hip and rotate it upward. Reach forward with the arm and reenter it into the water in front of you with an open palm. As your right arm is out of the water, your left arm is submerged, pushing water backward with the palm. The left arm rotates downward from where it entered the water, back to your hip. As your right arm begins to come out of the water, rotate your head out of the water as well and inhale. This action also can be performed on the left side. Kick your legs up and down in quick succession during the freestyle. The legs typically are not in sync with the arms and kick at a faster rate than the arms are stroking. As with the freestyle stroke, the arms mimic a windmill during the backstroke. The difference between the two strokes is that the backstroke is performed on your back with your face out of the water, looking up. Both arms should be fully extended at all times with palms open. Lift your right arm out of the water by your hip and rotate it upward. Reach backward and reenter the water with the arm behind your head. Your pinkie finger should enter the water first. While the right arm is moving through the air, the left arm is submerged and rotating downward and back toward your hip. Use your open palm to move the water. Kick your legs up and down in quick succession, with toes pointing away from your body. The butterfly requires that your arms move in sync with each other. Instead of only one arm rotating forward, as is the case in freestyle, both arms are brought out of the water and rotated through the air at the same time. Take a deep breath when your arms are reaching forward, as your head will be submerged once your arms hit the water and rotate downward. The legs move in sync as well. Keep your legs together and kick backward as hard as you can as your arms are reaching forward. Kick them again when the arms are submerged. 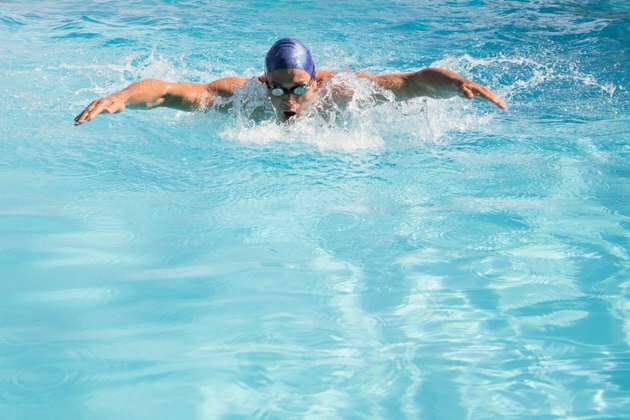 You should kick your legs twice during one butterfly stroke.